The brand new Nuxe Body range is every bit as indulgent as you’d expect from the sumptuous French brand. The new range takes the work out of getting body beautiful for the summer, and includes products for all aspects of your pampering regime: from the Body Fondant Shower Gel, to the Body Contouring Serum for Embedded Cellulite. This crystalline gel transforms into a gorgeously thick and creamy lather that feels divine on the skin. The Body Fondant Shower Gel is a gel cleanser with a difference – it contains absolutely no soap, and it feels incredibly moisturising during your shower routine. Your skin is left feeling supple and soft thanks to the radiance-boosting power of almond and orange flower petals, the scent of which is breathtakingly good! If your skin is feeling a little lacklustre, try the Body Fondant Body Scrub on for size! The botanical-based scrub uses 100% natural exfoliants of orange peel, lichee and walnut extracts to really buff away the dead skin cells and stimulate the dermis. The skin is left looking incredibly radiant and glowing, with a smoother texture and a softer feel. This creamy whip is utterly decadent. Not only does it feel heavenly, but it also works to tone and detox the skin. Its anti-ageing and tightening effect on the body takes all of the hard work out of keeping your skin looking and healing healthy and beautiful day after day. The impressive formulation has 2 patents to its name, and added almond and orange flower petals infuse the skin with an unbelieveable softness. A comprehensive body sculpting serum that smells delicious and helps you to look incredible! This ultra-concentrated formulation works to reduce the appearance of cellulite with a wealth of active natural ingredients including caffeine, yacon leaf extract, and Brazilian mimosa. Nuxe’s patented cocoa polyphenols minimise the look of dimpled skin, and intensely firm the body. Contour your body with this ultra fine oil that is especially formulated to reduce the appearance of cellulite. The oil has a refining effect on the stomach and the hips in particularly, working to infiltrate cellulite and reduce its appearance. Packed with 10 hardworking essential oils, this contouring oil is particularly good for massaging into the skin. Firmness and elasticity are improved, cellulite is diminished, and the skin feels soft and smooth. 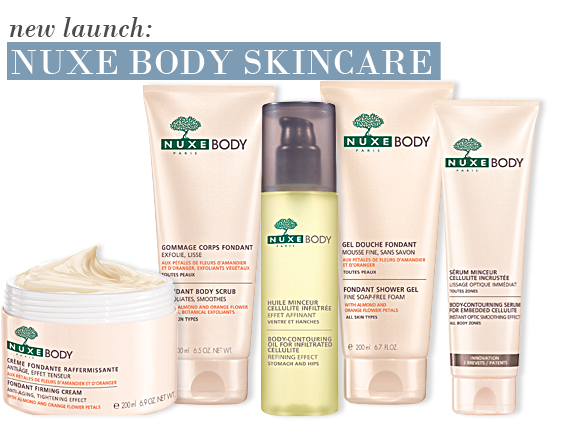 Take a look at the entire Nuxe Body range right here. This shower gel got me gagging at its fragrance. Utterly strong and smells like a fragrance of yesteryears. But the smell quickly dissipated into something milder, and there's when the magic starts. Leaves my skin feeling squeaky clean yet super soft. And I like that it does not have too much foam. Another wonderful product from Nuxe. This entry was posted on Wednesday, July 6th, 2011 at 3:23 pm and is filed under Bath & Shower, Skincare. You can follow any responses to this entry through the RSS 2.0 feed. You can skip to the end and leave a response. Pinging is currently not allowed.